Make sure to view the theme’s live demo on your various devices and browse through all of the demonstrated features. Additionally, Alyeska allows you to change how you want your website’s main navigation to display for the mobile user; you have three elegant options, as demonstrated in the above screenshots. You can choose from a light or dark style in your content area, along with whether you want it to be in a boxed or stretched layout. Then, what we really love about this theme is the “Flip Over” style main navigation. Select from one of our carefully crafted colors, and if you’re looking for more of a traditional look, select the “Classic” style navigation. 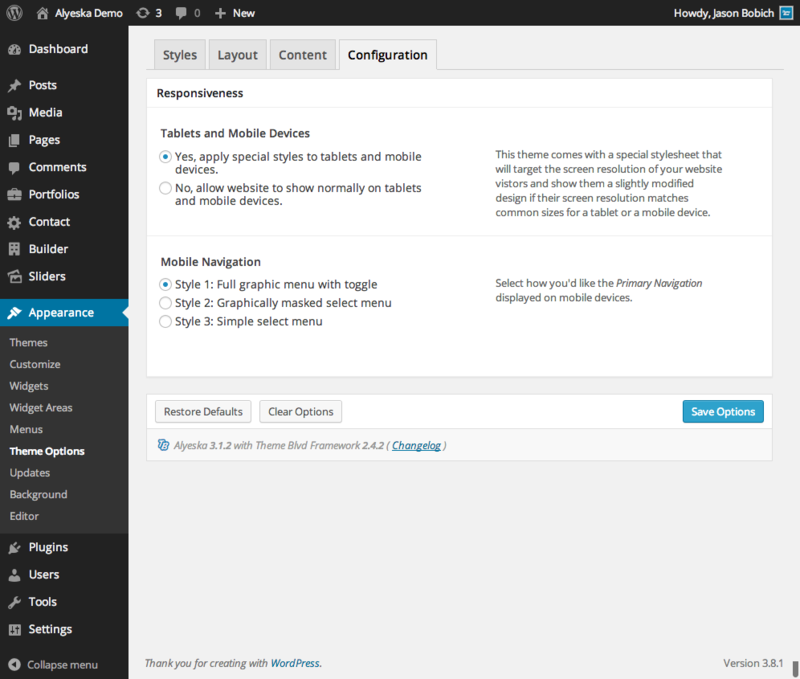 Configure your Theme Options at Appearance > Theme Options. Go to the Templates page and create a new custom template. Use “Alyeska Homepage” as your template’s starting point. Configure your element settings, including selecting your custom slider in the slider element, and save the layout.